What about aspects to other planets? If Saturn is in harmony with other planets, this gives you a powerful ally. But hard aspects with Saturn create limitation or strain. For example, a square to Venus can cause a person to feel isolated, and experience many obstacles to happy relationships. Saturn is linked to depression because of the cloud of self-doubt it casts. But Saturn builds faith in yourself since you’ve got to walk through the “dark night of the soul” to overcome these mysterious built-in pressures, fears, losses, etc. What is the best way to learn about my Saturn? When you know your Saturn sign and house position, try to find interpretations for both. By reading about the Zodiac sign that shares the sign of your Saturn, you’ll start to see what qualities the Celestial Taskmaster wants you to master. Keep it as a question in your mind that you can revisit when you meet someone that embodies these qualities. See if you’re drawn to those that have them naturally. What will it take for you to grow toward your Saturn? The first time Saturn comes back to meet your natal Saturn is in the late twenties. This is one of the most important times astrologically—a time of getting real with yourself and your mission in life. If you’ve been coasting on bravado and wishful thinking, Saturn will cause the foundation to dissolve beneath your feet. It can be a time of upheaval, stress, major re-evaluation and change. For some, it gives confirmation that you’re on the right track. And you get another chance to take stock when Saturn returns again in your late 50s. Who was Saturn in Greek Mythology? Saturn was the God Kronos, father of Zeus, who was known for devouring his offspring soon after being born. He did this because he feared that they would surpass him. But Zeus, who was protected by his mother, returned to face his father, and Kronos’ fears were realized through death. Similarly, if we clamp down on what we fear the most, eventually it destroy us. Saturn has been depicted as the punishing father, but also as the Grim Reaper, who cuts life short. Mortality is the ultimate restriction, and as Father Time, he is the wise one that inspires urgency in our quest to fulfill our life mission. 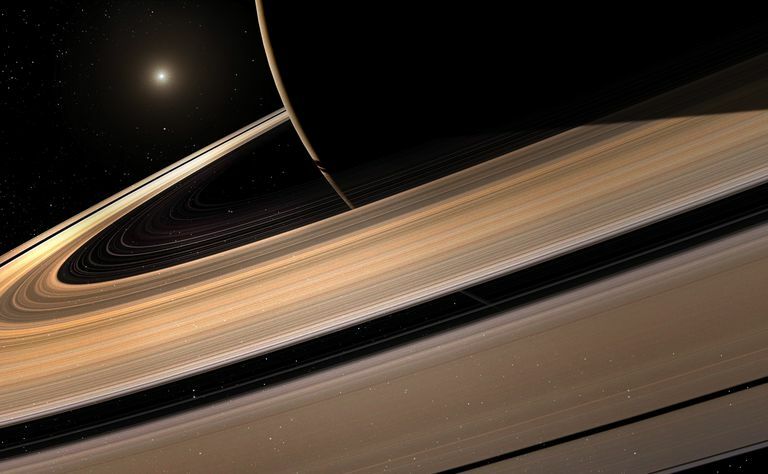 Saturn is the furthest planet away that is still visible to the naked eye. Like Jupiter, it is made of hydrogen and helium and has a magnetic field 578 times more powerful than Earth. The favorite Space fact of NASA’s Dr. Linda Spilker is that if a bathtub could be built big enough, Saturn would float. Galileo first saw the distinctive rings through his telescope in the early 1600s. NASA scientists are studying the atmosphere of Titan, the largest of Saturn’s Moons because they suspect that Earth had a similar beginning. Titan has some of the same building blocks for life to be supported. The movements of Saturn, also known as the “Great Malefic,” used to be observed with fear and came with warnings passed from the astrologer to client about pending shortages, bad luck, great loss or punishing circumstances. There’s some balance to how we see Saturn now since many of its hardest lessons and trials lead to the richest, most hard-won rewards. For example, a self-made man or woman may have many hard aspects with Saturn, and end up being widely admired for what they’ve overcome. This is the person that emerges out of deep poverty, takes advantage of every educational opportunity, and becomes a worldly success. Saturn’s gift is the pressure that keeps us focused on our own path. It’s seriousness, like the sign it rules, Capricorn, comes from knowing that some goals require us to plod through dread to generate more inner discipline. Jupiter balances this out faith, optimism, and trust that all the hard work will pay off. Saturn doesn't promise success, but by laying out the steps, and sticking to the path despite the distractions and doubts, you start to gain Saturn-approved mastery regardless of the outcome. It is the path to unshakable self-esteem. Saturn’s influence may seem heavy and limiting, but that is the nature of the physical realm. When you toss up your hands and claim to be overwhelmed, inert, depressed, someone else has to be the authority in your life. This authority can be given to a boss, parent, spouse, teacher, friend, or even a punishing voice inside your head. Once you’ve been humbled-humiliated enough, you might decide to pull yourself up and be your own boss. The sign and house position of your Saturn shows where these life dramas will likely take place.